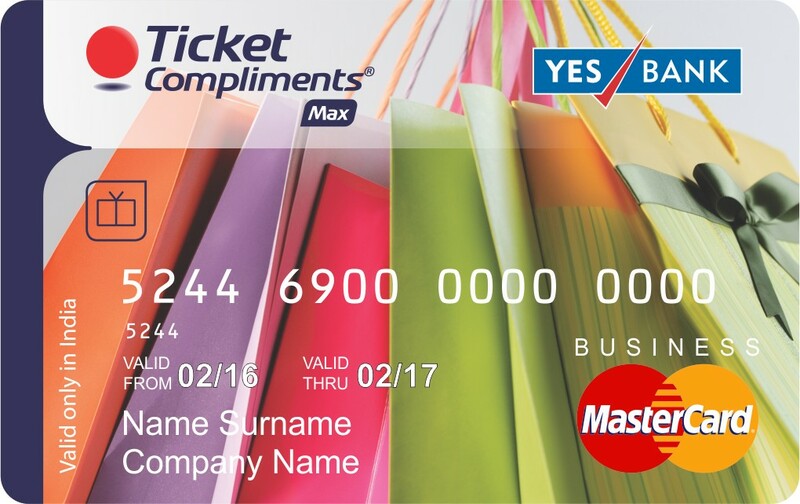 Ticket Compliments Yes Bank Max Gift Card enables you to enjoy unmatched freedom of choice. It can be used across 1 Million plus terminals and online portals, which accept MasterCard making it the most power packed gifting solution. Now Shopping for favorite brands, indulging at a spa, buying jewelry or enjoying a fine dining experience is an absolute delight. - Accepted across all POS machines and Online portals which accepts MasterCard. All beneficiaries will get the MITC (Most Imp Terms & Conditions) as part of the welcome kit. Also, the detailed T & C is mentioned in our website as well. 1. 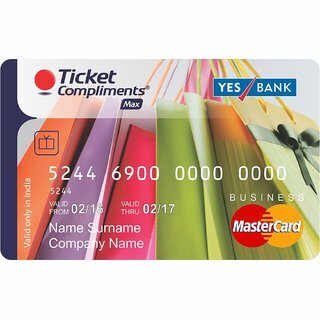 The Card can be used only in India and cannot under any circumstances be exchanged for cash. 2. The Card is Non-Reloadable in nature. 3. Card cannot be used at any ATM's. 4. If a Card is lost or stolen, the Cardholder must immediately report such loss/theft to Edenred? s 24 Hour Contact Center E-Assist (assist-IN@edenred.com) or 1860-233-5555* / 022-2545 5555 / 022-6143 3333. 5. Multiple Cards can be clubbed in 1 billing. 6. Validity - 12 Months from the date printed on the face of the card. 7. Cardholder and Corporate purchasers agree that the issuing of Card is subject to rules and regulations introduced or amended from time to time by the Reserve Bank of India or any other regulatory body. 8. Edenred (India) Pvt. Ltd. or YES BANK is not responsible with regards to the quality of the product / service delivered to the Cardholder by the Affiliate Establishment. 9. For security reasons, you will receive an inactive card. On delivery of your card, please place your activation request. - After receiving the activation request, the card is activated within 7 business days. Disclaimer: Shipping Charges include both activation & shipping charges. Note - Gift card will take upto 48 hours to reach to the customer.